The possibility to activate the trial period of the program is available for the users of Android, iOS, Windows Phone, Windows Mobile, and for BlackBerry users. The trial period allows you to enjoy the program and the maps for 7 days for free. Nevertheless, you are not able to use the Navitel.Friends and Navitel.Cloud services during the trial period. Please note that it is only available for those devices that have not had the trial period activated before. If the program license key has already been activated, the trial period for a particular map cannot be activated afterwards. To learn how to activate the trial period of the program on your device, please follow the steps described below. 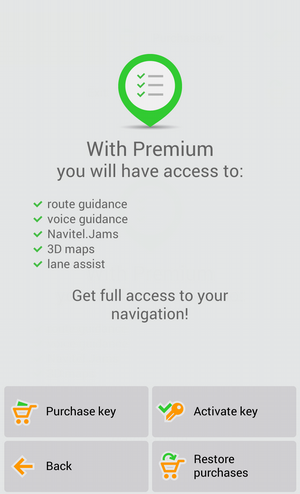 Run Navitel Navigator on your device. Install maps (see instruction for map installation). If you have made a purchase via the store of the OS of your device, you can restore it on another device of the same OS by using the same store account. The possibility to restore the lost purchases is available only for iPhone/iPad, Android, and Windows phone 8.x.-based devices and for purchases made from Google Play not earlier than 16.09.2014, and for the Navitel Navigator version not younger than 9.2.0.4. Select Restore purchases. The system will request you to enter the password of your Apple/Google/Microsoft profile. Restoration of purchase made with an account of a service different than those is not possible yet. Install maps (see instruction for installation of map). This method should be used if you already have a license key. If you do not have a license key, see the instruction on how to get it. Please also note that this method of license key activation is not applicable on iPhone/iPad. If you are about to activate the license key of the program on your iPhone/iPad for the first time, it is best for you to do it via the in-app purchase (see instruction). If you have activated the program license key on your iPhone/iPad before, please restore the product by following the instruction given on this page to continue using the program. Note: when purchasing the key via the interface of the program, you do not have to activate it. Tap the Enter license key field. Enter the license key, and then in the top-right corner of the screen, click the checkmark. A window that displays the license key number and the ID of the device will open. Tap OK.
After you complete the activation, the program will propose you to install maps. In case of registration of Navitel Navigator. District, you will need to activate the license key for this map (see the instruction). Given that a key has already been activated on a device, in order to activate it on a different device, first you must deactivate it. To do so, please fill out the key deactivation form. In this form, in the Re-registration reason field, select the Device replacement option. Before sending the deactivation request, make sure the application works on the new memory card. Press the button Key Activation. Press the field Enter the license key. In the appeared window of the screen enter the license key number, then in the upper right corner of the screen press on the check box. In the opened window the number of the license key and serial number will be displayed. Press the check box in the upper right corner. If the maps have not been downloaded previously, download them according to the instructions. This method of license key activation should be used in case there is no access to the Internet from the device, on which you want to install the application. Log into your personal account at NAVITEL® website. Proceed to the Activate a key section. In the Activation type field, select This is my first activation of Navitel Navigator, and then enter the name of the device (you can enter any name), ID, and Navitel Navigator license key into the fields (case sensitive). Finally, click Activate. 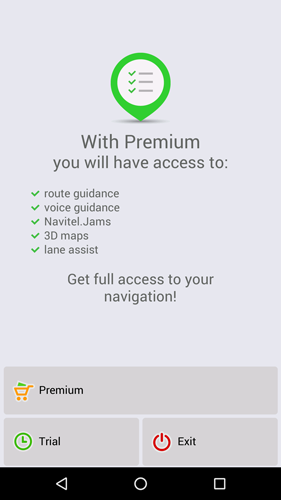 ID assigned by the program to your device will be displayed upon clicking the button, or can be found in the program if the trial period has been activated: Menu > My Navitel > Maps for trial period > Navitel Navigator. Go to the My devices (updates) section of your profile, and then select Activation file. Save the activation file NaviTel_Activation_Key.txt on your PC. On the navigation device, exit the program Navitel Navigator and connect the device (or its SD-card) to a PC. Copy the activation file to the device memory or on SD-card into the folder \NavitelContent\License\. Make sure that after copying the file has the name NaviTel_Activation_Key.txt, and not the NaviTel_Activation_Key(1).txt or NaviTel_Activation_Key(2).txt or other. Rename it if necessary. Note: Windows can hide known file extensions. If the name of the source file is displayed as NaviTel_Activation_Key, and not as the NaviTel_Activation_Key.txt, then no need to add .txt manually. In the field Type of Activation, select This is my first activation of Navitel Navigator. Enter the device identification (you can enter any name), serial number, license key of Navitel Navigator in the corresponding case-sensitive fields. Serial number, attributed to the device by the program, displayed after pressing the button on the page Unregistered version. Serial number can consist of 5, 12 or 32 characters. In 7.0. - 9.2. versions of the program the serial number can be displayed after pressing the field Unregistered version of the application in the upper part of the screen. Go to My Devices (update) and select Activation file named after activated device. Save the activation file NaviTelAuto_Activation_Key.txt on your PC. On the navigation device, exit the program Navitel Navigator, switch off the device and connect the device (or its SD-card - depending on the installation location of the program) to the PC. Copy the activation file to the device memory or to SD-card in the program folder (Navitel, NaviOne, MobileNavigator or other options - depending on the model), beforehand having deleted the old activation file(s) NaviTelAuto_Activation_Key.txt and/or NaviTelAuto Activation Key.txt (if any) from the NaviTelContent/License folder and the folder with the program. Make sure that after copying file has the name NaviTelAuto_Activation_Key.txt, and not NaviTelAuto_Activation_Key (1).txt or NaviTelAuto_Activation_Key (2).txt or other. Rename it if necessary. Note: Windows can hide known file extensions. If the name of the source file is displayed as NaviTelAuto_Activation_Key and not as the NaviTelAuto_Activation_Key.txt, then no need to add .txt manually.